A large map of Canada hung above the blackboard in our elementary school classroom in Ontario. Whenever our teacher rolled it down, we gazed raptly at a cartographer’s rendition of our great country “from sea to sea” (well, technically from Atlantic to Pacific oceans, or from Gander to Tofino)—sitting atop a deliberately dwarfed United States below. That big pink-colored map gave all Canadian schoolchildren of the 1950s and 60s a warm, fuzzy nationalistic feeling. We were blessed, and we knew it. But our eyes always moved up and to left, to the prairie and the Rockies, and we daydreamed of someday heading out West ourselves, to Alberta—a place that epitomized adventure, natural beauty and a fresh start. Today, however, Alberta is the new Texas, maybe even Saudi Arabia, awash in a natural resource that the energy-hungry world demands and for which it is willing to pay top dollar. Money is pouring into the province, the standard of living is climbing, and Albertans are swaggering around as though they have really accomplished something. The sad thing is that some of the most majestic natural beauty in all of Canada is being willfully polluted and destroyed as tar—sticky, dirty oil—is clawed and scraped off vast regions of pristine landscape. Alberta, beautiful Alberta, has made a pact with Mephistopheles. Holds it in His hand. There was an aesthetic vision interwoven with our deepest sense of the transcendent. And this was reinforced by other artifacts of mid-20th century Canadian culture. On Sunday mornings, as we got ready for church, we would hear the Canadian Back to the Bible hour on our radio, and the Bible teacher was none other than Ernest C. Manning, premier of Alberta. I can remember leafing through the pages of a Canadian magazine, and encountering a picture of two or three boys playing hockey on a winter lake in Alberta. The photographer had caught the exquisite purple hues of twilight coming on, when the puck was soon to become invisible. To this day that picture evokes a pang of yearning beauty in my soul. But that was what Alberta embodied for us then and even now. It’s good to be Alberta bound. I still remember the moment, driving along the Trans-Canada highway, when for the very first time we sighted the Rockies on the western horizon. Magical. Wonder. Ecstasy. 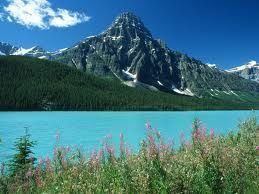 Banff, Castle Mountain, Lake Louise. The big sky, the Alberta Pool elevators and little towns and railway sidings. Driving between Edmonton and Calgary, the rich fields of grain, the well-maintained white fence-lines of prosperous ranches and horse farms. The Peace Country. The miles of forest all the way up to Great Slave Lake in the territories. That’s why news of the ravaging of Alberta these days comes as such a deep sadness even to someone now living in Southern California. Alberta has been for Canadians what Quebec was for the 17th century French, what New England was for the Pilgrims—a fresh start for civilization, a New Jerusalem in the wilderness. 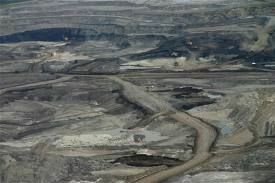 And Albertans have exchanged that vision of pristine beauty and their duty of stewardship for “developing” the tar sands. Here below is a link to a moving presentation of what is happening in Alberta by Canadian photographer Garth Lenz. The visuals are stunning, but the message is profoundly disturbing. How often do we find a presenter at a major university (in this instance, the University of Victoria), breaking down with emotion over the environmental holocaust he has chronicled? By all economic measurements, Alberta is on a roll. Real estate values are higher than ever before. Now Albertans can drive Escalades, and take trips to Vegas and Hawaii. They can spend money in their low-ceiling indoor malls and dream of an NFL franchise for Calgary. Sometimes I feel angry about how Albertans have chosen to foul their own nest, but mostly I just feel a deep sadness–sadness for the spiritual banality of it all and for what might have been. Perhaps at a personal level I mourn the loss of my own innocence in believing for a good part of my life that Alberta really was different.